Released in October 2013, the Asus Fonepad 7 is one of the newest and most craved tablets from Asus. The device is available as Asus Fonepad 7 LTE ME372CL with LTE band and Asus Fonepad 7 ME175CG with 3G and Intel Atom Z2520 1.2GHz processor. Although known to function very well, after a long time of using it, the tablet may experience a few software-related issues that could interfere with your user experience. If that is the case, you may want to regain functionality of the device my performing a hard reset on the Asus Fonepad 7. Before moving on with the master reset procedure, it is important to know how this process is going to affect the tablet. In a few words, resetting the device to factory settings will erase all the data stored on the internal memory of the Asus Fonepad 7. Given this situation, it is recommended to make a backup of all applications, accounts information, media content and contacts you’d like to save. The Asus Fonepad 7 runs on Android v4.2, also known as Jelly Bean, and can be upgraded to the version 4.3 of the same operating system. Coming with a dual-core 1.6 GHz processor and 1 GB RAM, the tablet also has an external micro SD card that can store up to 32 GB extra. In terms of taking photos and recording videos, the device is equipped with two cameras: a primary 5 MP camera attached with autofocus and geo-tagging and a secondary 1.2 MP camera. The device also comes with a variety of included applications such as predictive text input, organizer, photo viewer and editor, etc. 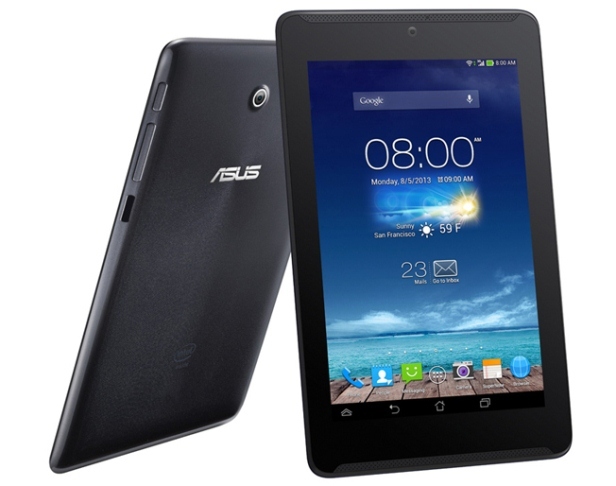 If the Asus Fonepad 7 is only experiencing minor software problems, you could first try to perform a soft reset. This can be done by pressing and holding the Power button for about 6 seconds. 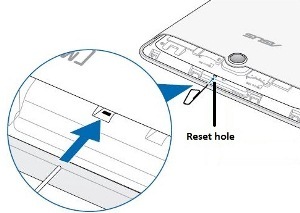 If this doesn’t solve your issue, you can also force reboot by pushing the Reset Hole with a paper clip, as shown in the image below. In case the problem seems to be more complex and a soft reset does not solve it, you can also do a master reset of the Asus FonePad 7. As mentioned before, restoring the tablet to factory software will wipe all the data stored on it. This is why you can’t get started without saving all important information, which can be done by connecting the tablet to a computer via the USB cable and copying all the data into a separate folder. Turn the phone off and fully charge it before getting started. Press and hold the Volume Down and Power keys at the same time until the Recovery Menu appears. Using the Volume keys, scroll down to Factory Reset / Wipe Data and confirm using the Power key. The tablet will automatically reboot; don’t interrupt the procedure at any time.